"I saw the audience faces change from surprise to delight soon after you started!" Val Haines, Hadleigh Folk and Acoustic Music Nights. 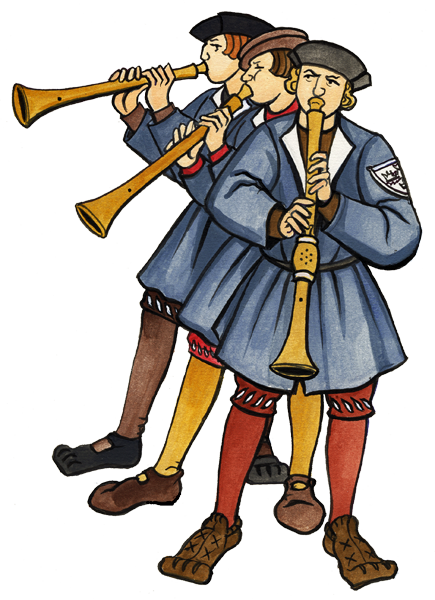 Like most European Towns of any size, Colchester had a band of Waits (civic musicians) throughout the Middle Ages, Renaissance and Baroque. The band would have been employed by the town to perform at civic ceremonies and processions and to entertain the populace. The modern Colchester Waits play reproductions of the instruments of our forebears - shawms, trumpets, sackbutts, cornetts, lysards, bagpipes, recorders, gemshorns, fiddles and more. We perform vibrant historical music with a sense of history, enthusiasm and fun, wearing the livery of a 16th century band. Our musical tastes range from the early Middle Ages to the present day and we do our best to provide a fitting tune for any occasion. We also regularly perform alongside Colchester Historical Dance to demonstrate the dance music of the 15th-17th Centuries. The Waits have become a regular fixture at Hedingham Castle and at the Colchester Medieval Festival, and Witham Medieval Fayre. 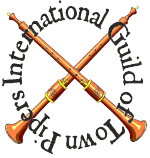 This year we're also off to King's Lynn for the International Festival of Town Pipers, to Bolton Castle for Medieval Music in the Dales and to York to accompany the Mystery Plays around the city. See our diary page for details of these and our other events. We are always open to new members and rehearse monthly on Friday nights (usually the first Friday of the month). If you are interested in joining or booking the band please get in touch with Musical Director Lizzie Gutteridge.